tion is long both countries. 2000s; however, the situation has not changed greatly. tion explains this in detail. wealth ratio on predictions of stock returns in Japan. ductivity has not been examined fully. based on the theoretical model in . sumption and output in the short run. mand and output is determined only by the demand side. values of the permanent component of productivity. the assumption of white noise disturbances is violated. a series is fractionally integrated . variables employed are consumption and production . and future values of the endogenous variables. any of the current designations. The results of the unit root tests are shown in Table 1.
case of the PP test for empirical estimations. sumptions in reality with the HP filter and as estimated. 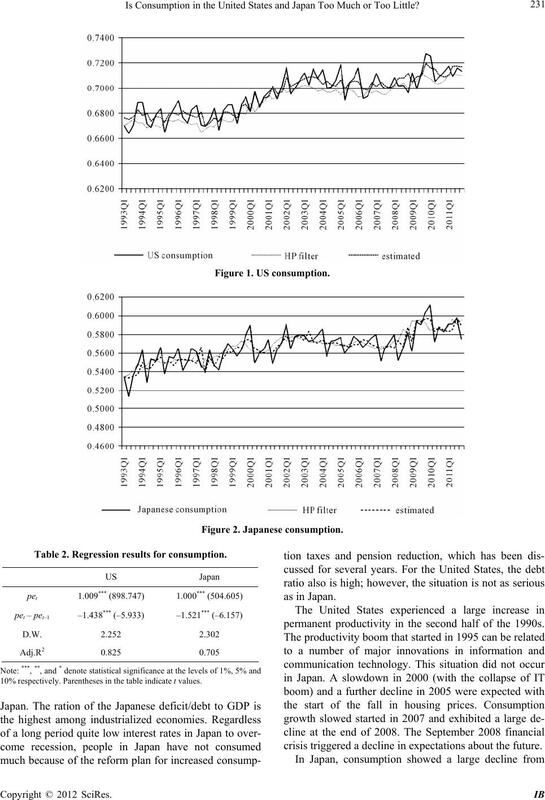 levels of Japanese consumption were found in general. Table 1. Unit root tests. PP tests, the series contain a unit root under the null, whereas the KPSS test assumes stationarity under the null. Table 2. Regression results for consumption. 10% respectively. Parentheses in the table indicate t values. permanent productivity in the second half of the 1990s. crisis triggered a decline in expectations about the future. 2007 to 2009, similar to the case of the United States. Finally, the VAR results are shown in Table 3. Table 3. 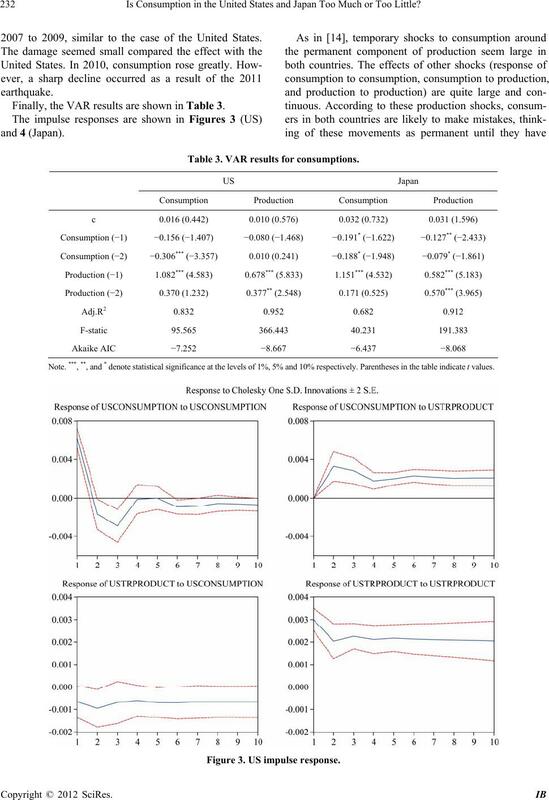 VAR results for consumptions. Note. ***, **, and * denote statistical significance at the levels of 1%, 5% and 10% respectively. Parentheses in the table indicate t values. Figure 3. US impulse response . Figure 4. Japanese impulse response. havior in terms of too much or too little consumption. identify shifts in permanent productivity. We appreciate a referee’s comments and suggestions. 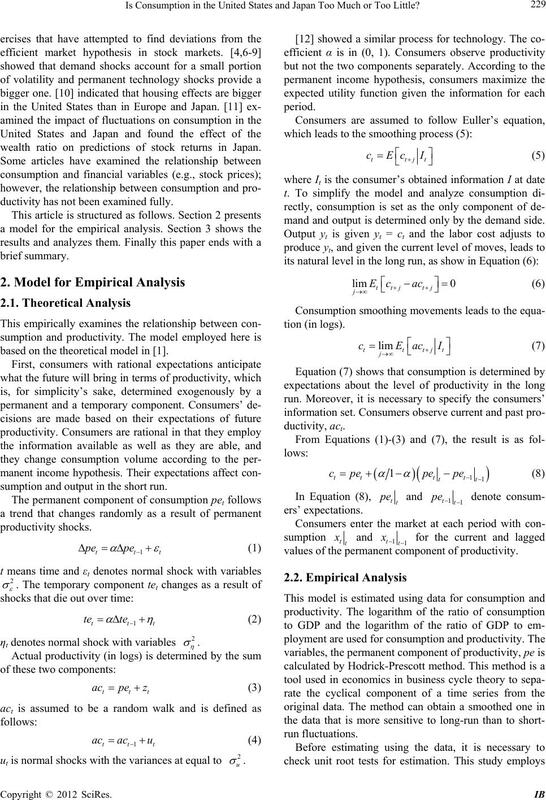 NBER Working Paper, No. 15015, 2009. No. 2, 2012, pp. 207-209. 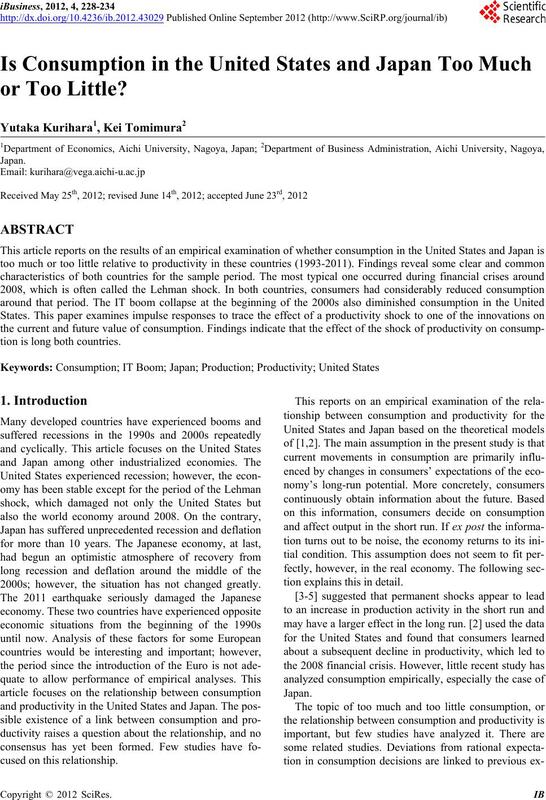 American Economic Review, Vol. 79, No. 4, 1989, pp. 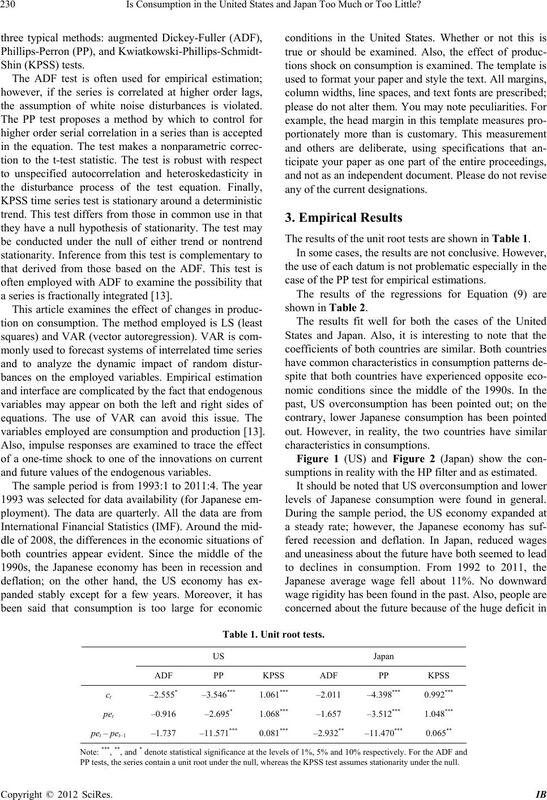 US Data?” Quarterly Journal of Economics, Vol. 107, No. work,” Princeton University Press, Princeton, 2008. Stock Prices,” American Economic Review, Vol. 99, No. 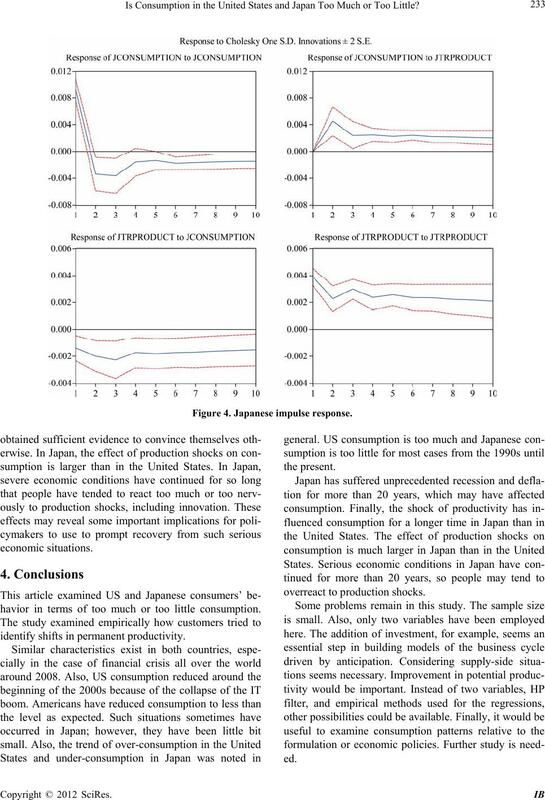 Cycle Fluctuations,” NBER Macroeconomics Annual, Vol. 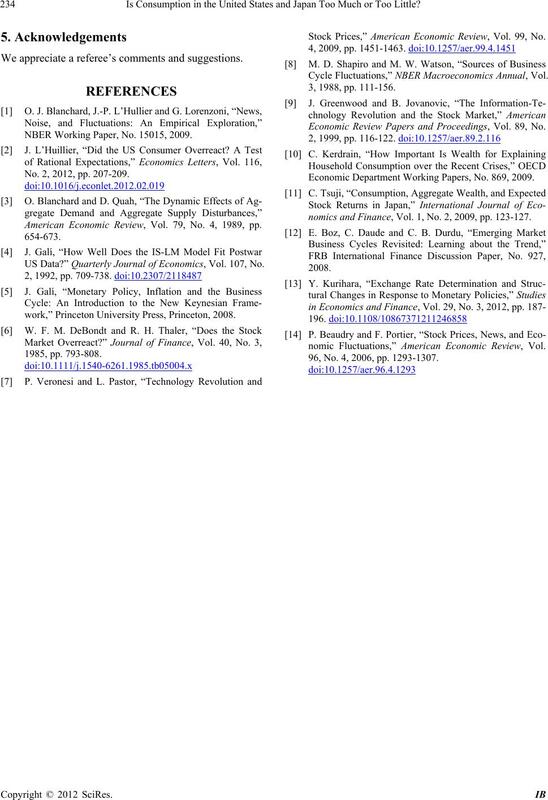 Economic Review Papers and Proceedings, Vol. 89, No. Economic Department Working Papers, No. 869, 2009.
nomics and Finance, Vol. 1, No. 2, 2009, pp. 123-127.
nomic Fluctuations,” American Economic Review, Vol. 96, No. 4, 2006, pp. 1293-1307.